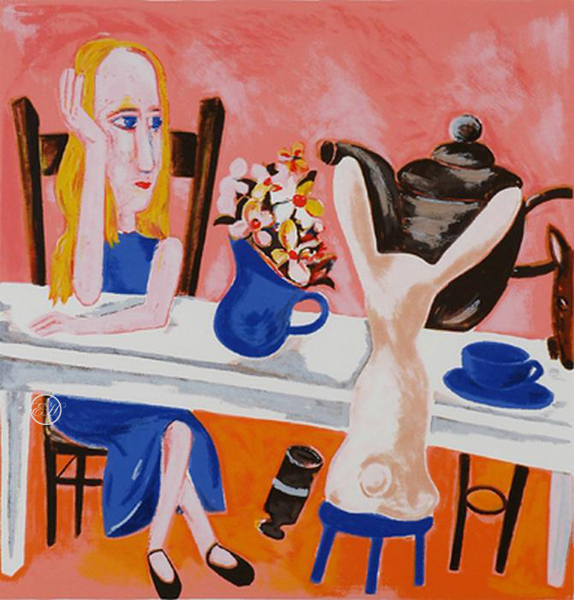 This Limited edition Silkscreen titled Pink Alice was released in 2001 by Charles Blackman and is from his famous Alice Series, other titles are – Chess Game, Alice’s Jug, White Rabbit, Alice’s Adventures, Always Tea Time just to mention a few. Pink Alice – image size is 71.5x68cm, sheet size is 105x75cm, it is no longer available other than this one in stock, to our knowledge. Alice Series Charles Blackman the Alice paintings, made in the mid 1950s, are some of his most important works. Charles Blackman’s acclaimed series of Alice paintings came about after listening to the classic Lewis Carroll book in taped form with his sight-impaired writer wife, Barbara. The impact of his discovery of Alice in Wonderland coincided perfectly with his readiness as an artist. What attracted him to Alice, he recalled, was that “once you go through the mirror, everything is possible. It had to do with my feelings about femininity and the fact that scale, size and relationships were altered… It is his Alice in Wonderland series of pictures that are now highly expensive collectors’ items. Awards 1997 OBE 1963 Georges Invitation Art Prize, Georges Gallery Melbourne (one painting and one drawing) 1960 Helena Rubin stein Scholarship, Melbourne 1960 George Crouch Prize, Ballarat Fine Art Gallery 1960 Wins prize. A. Shore, The Age (February) 1958 George Crouch Prize, Ballarat Fine Art Gallery 1958 Rowney prize, Richmond Gallery Melbourne Collections National Gallery of Australia, and all state galleries Numerous regional galleries and university collections He is represented in the Musee D’Art in Paris, the Contemporary Art Society of London Selected References 1993 Charles Blackman: Schoolgirls and Angels, catalogue for retrospective at NGV 1989 Shapcott, T., The Art of Charles Blackman, Andre Deutch, London 1983 Amadio,N., Orpheus the Song of Forever, Craftsman Press, Sydney 1982 Amadio, N., Charles Blackman’s Paris Dreaming, A.H. & A.W. Reed, Sydney 1980 Amadio, N., Charles Blackman: The Lost Domain, A.H. & A.W. Reed. Sydney 1976 Australian Painters of the 1970s, Mervyn Horton, Ure Smith 1967 Shapcott, T., Focus on Charles Blackman, University of Queensland Press, Brisbane 1965 Mathew, R., Charles Blackman – Monograph, Georgian House, Melbourne 1965 Alvarez, A The Paintings of Charles Blackman: The Substance of Dream.